Contact Lenses — Spectrum Eye Care, Inc. Contact lenses provide a glasses free way to correct vision. Contact lenses can be particularly beneficial for individuals with a high refractive error where the lenses in their glasses may be thick and sometimes heavy. They can provide clear peripheral vision as compared to having to move your head with glasses or the temples on glasses sometimes get in the way. Contact lenses can also be beneficial for playing sports, working out, or other outdoor activities as you do not have to worry about glasses sliding down or falling off during a workout. 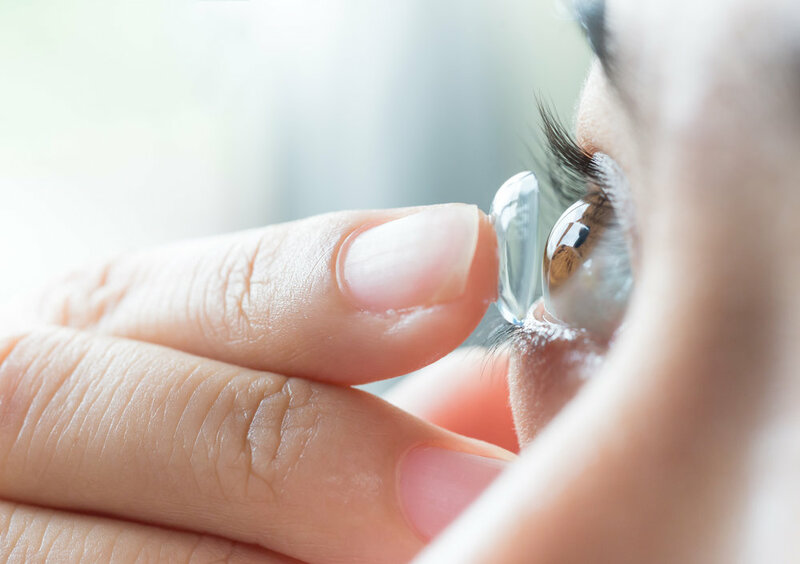 Some soft contact lenses can also correct for astigmatism and there are several options to aid with near vision for presbyopia including multifocal contact lenses. 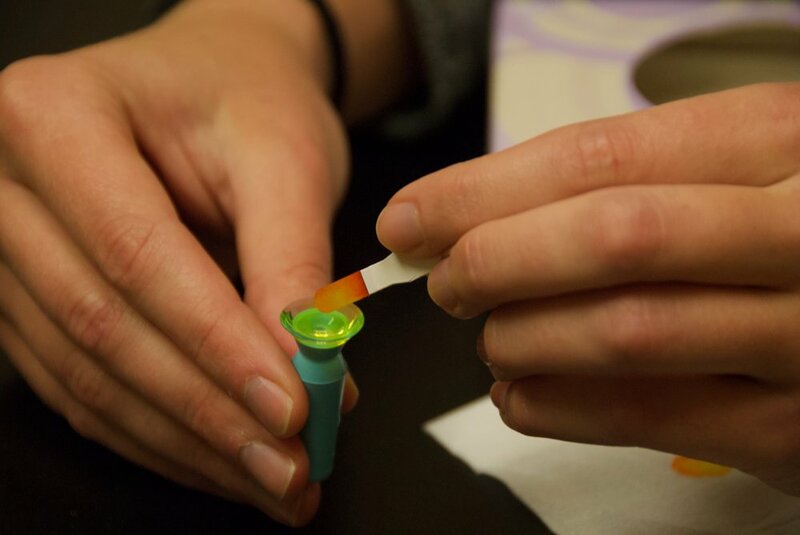 While contact lenses have many benefits there are important safety steps and proper hygiene habits to promote many years of successful contact lens wear. Be sure to follow your doctor’s recommendation on when to replace the lenses. Talk to your eye care provider today to learn if you would be a good candidate for contact lenses and how they could benefit your lifestyle. Wash hands thoroughly before inserting contact lenses. Dry hands with a lint free towel. Start with the contact lens for the right eye. Examine the lens for any tears or defects. Make sure the contact lens is not inside out. Raise the upper lid by grabbing the eyelid at the base of the lashes. Pull down the bottom eye lid. Insert contact lens. After you feel the lens is on your eye look up, down, left, and right to help center the contact lens before blinking to avoid blinking the lens off the eye. Repeat steps 4-6 for the left eye. Rinse the contact lens case with solution and store upside down on a paper towel to dry. Wash hands thoroughly before removing contact lenses. With your index finger slide the lens to the white part of the eye, then pinch the contact lens with your thumb and index finger. Gently rub the contact lens with solution to remove deposits, then rinse the lens. Fill a clean contact lens case with fresh solution and store the contacts overnight in the appropriate right and left buttons. If working over a sink it is recommended to close the drain before picking up the contact lens. To avoid confusion, start with the right contact lens in the right eye every time. 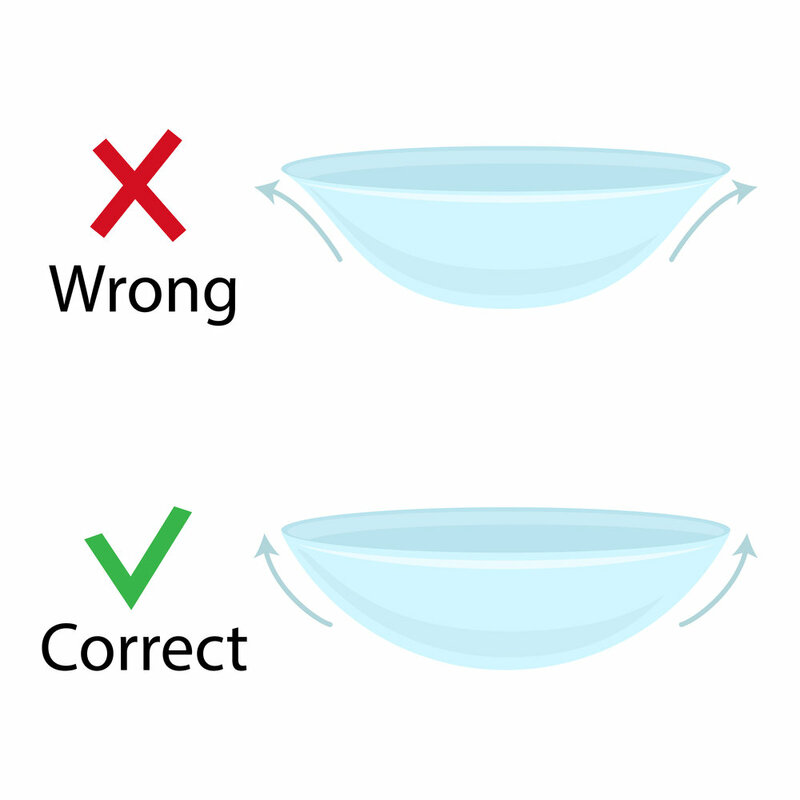 This will help prevent placing the wrong contact lens in the eye. Put contact lenses in before applying make-up to avoid getting make-up on your lenses or in your eyes. Gas permeable lenses are a hard contact lens that correct refractive disorders such as nearsightedness and farsightedness. These lenses can also be designed to correct for astigmatism and presbyopia. Scleral contact lenses are large diameter gas permeable lenses that are designed to vault the cornea and rest on the white part of the eye or the sclera. This design provides a perfectly smooth optical surface allowing for more clear and crisp vision. This is particularly beneficial for individuals with an irregular corneal shape often due to diseases such as keratoconus or after corneal transplants. These lenses can also be used as a management tool in severe cases of dry eye as the scleral lens keeps the cornea bathed in saline throughout the day. The images shown above show a scleral contact lens, including the process of inserting sed contact lens into the eye. Click here to learn more about Bausch and Lombs recycle program, “One by One” and how you can do your part to reduce your impact on the environment. 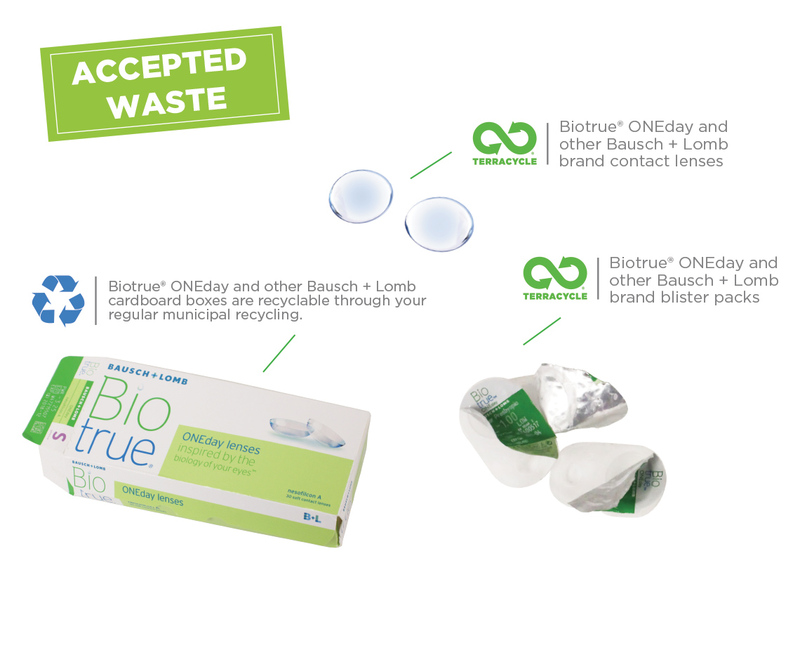 Blister packs and the contact lenses from any brand of contacts can be recycled. Cardboard boxes can continue to be recycled locally. Disclaimer: The information and reference materials provided are intended solely for the general educational purposes and discussion with patient’s own physician. Information presented here is intended for prescription contact lenses only.